Commercial Wedding Photography on historic tile floor at Courtyard Marriott -- SETUP: f/5.6 1/80th ISO 400 STROBIST: SB-800 @ 1/2 power with shoot-through umbrella on light stand 9' high behind model & SB-600 @ 1/4 power with diffuser cap to frame right held by assistantThis was my most complex indoor shoot to date involving two models, two makeup artists, a dress designer, a florist, a caterer, a hotel sales manger and one photographer's assistant. I am very happy to say it turned out to be perhaps my best indoor photography work to date. It is very satisfying when a big team effort results in such final images. I had worked with the bride model, Nancy, before on a commercial fashion shoot in Safety Harbor. The sales manager, Ryan, of the Courtyard Marriott, who hired me to makes these images, I had met in weeks past at a networking event then in subsequent meetings discussing various photography projects. My photographer's assistant was Natasha, a former DSLR Photography Lesson student. When you can have that many people you already know on a photo job, it makes it much more comfortable. The above shot of Nancy sitting on the historic tile floor of the hotel was my idea, which I came up with on a survey of the hotel a few weeks before the shoot itself. I am standing on a marble staircase (pictured below) offering the perfect logistics to make this kind of shot. I wanted to go with a muted light setup producing a bit of a natural vignette to the image as I chose to most prominently light the model in the center. St. Petersburg Commercial Wedding Photography - Models Brad & Nancy framed by arching historic doorways - SETUP: f/4 ISO 200 1/60th STROBIST: SB-800 @ 1/4 power with reflective umbrella on light stand to frame left & SB-600 @ 1/4 power with diffuser cap to frame right held by assistantThis archway shot was another I had previsioned during a location scout of the hotel. I really like repeating patterns and these archways caught my eye right away. There were actually three arches, but the first one could not be worked into the shot. This photograph turned out just as I had imagined. St. Petersburg Commercial Wedding Photography - Nancy reflected in the swimming pool - SETUP: f/5.6 ISO 200 1/100th STROBIST: SB-800 @ 1/2 power with shoot-through umbrella on light stand to frame left & SB-600 @ 1/2 power with diffuser cap to frame right held by assistantThe bride reflected in the pool was another pre-planned shot. As you might be able to tell, being able to scout a location some time before the scheduled shoot is advantageous as one then can move from location to location and concentrate more on executing the shot at best as possible rather than where will the next shot even be. Again, I am pleased with how the shot turned out because due to the width of the pool I could not get my speedlights that close to Nancy, but as it turned out there was no lack of light for the shot. 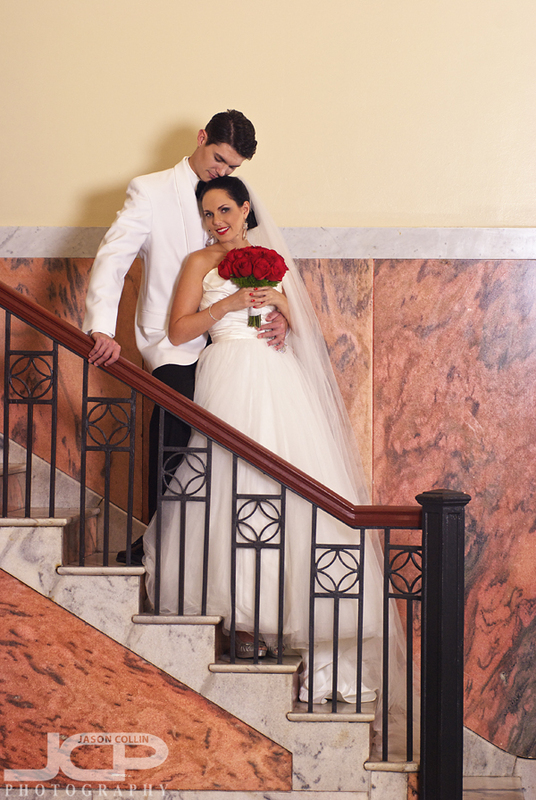 St. Petersburg Commercial Wedding Photography - Models Brad & Nancy on the historic marble staircase - SETUP: f/4 ISO 400 1/100th STROBIST: SB-800 @ 1/2 power with shoot-through umbrella on light stand 9' high behind me & SB-600 @ 1/4 power with diffuser cap to frame right held by assistantThe original marble staircase was something the hotel sales manager definitely wanted to showcase in one of the shots. I previsioned perhaps the bride walking down the staircase or maybe the bride on the bottom of the staircase being helped down by the groom, but thanks to the models' creativity with their posing, I liked this shot the best of the staircase series. I cannot say how much it helps a photographer to work with great models! It makes my job so much easier. 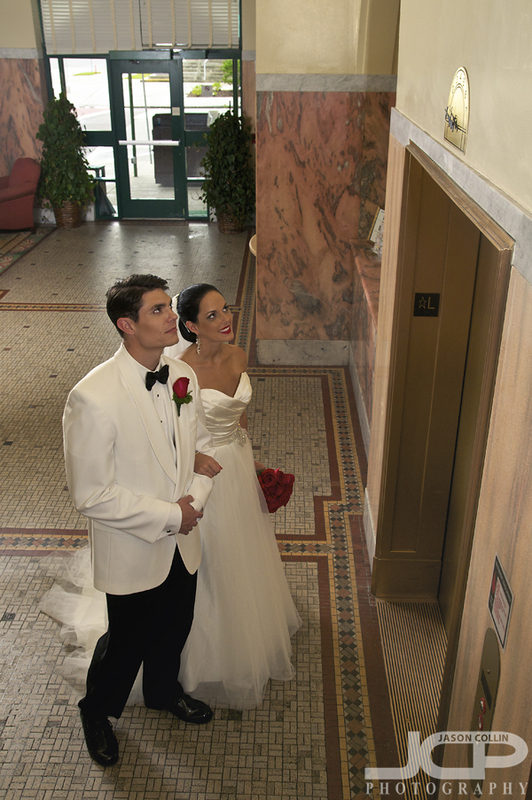 To feature the hotel's original elevator I chose to once again use the nearby marble staircase as a vantage point. Shooting straight on to the elevator produced a flat shot. 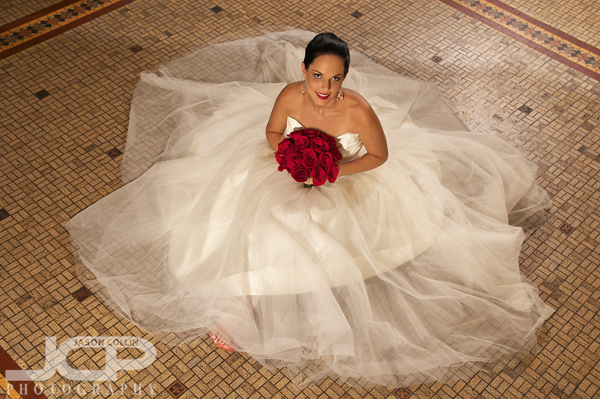 I felt shooting from above like this created a dynamic image showing the bride & groom's anticipation, while at the same time including the elevator in the shot, as well as the original tile floor. I chose also to again keep the lighting soft & muted, to help create that classic look. There was no trouble to light up the models from the front (within the room), but this meant the hallway looked very dark. The solution was to place one speedlight on the left of the door frame pointing toward the opposite wall. Not only did this fill the hallway with light, it provided a strong backlight to the shot. St. Petersburg Commercial Wedding Photography - models using their own creativity - SETUP: f/4 ISO 400 1/100th STROBIST: SB-800 @ 1/2 power with shoot-through umbrella on light stand @ 1/4 power in bedroom to the right & SB-600 @ 1/16th power with diffuser cap to frame left directly on the floor pointing straight up Both Nancy and I had the same idea for a through the doorway bedroom scene shot. However, her and Brad came up with the pose and prop setup (shoe placement, jacket coming half off) on their own, which I would say made the shot nearly entirely if not for the tremendous challenge I had trying to light everything. It was by far the hardest shot to light for me ever. Getting rid of shadows behind Brad was the main challenge. Putting the second speedlight on the floor behind him solved it, after lots of trial and error. Ultimately I did have to clone out one shadow along the right side of the bed from umbrella edge spill. This was also the last shot of the day (3.5 hours of straight shooting!) so it was great to end on one so challenging. I appreciate the work of everyone at the hotel that day helping make the images in this photo story.